This post was contributed by guest bloggers Joachim Goedhart and Marieke Mastop from the Section of Molecular Cytology and Van Leeuwenhoek Centre for Advanced microscopy, University of Amsterdam. The previous two posts in this series described a practical approach to selecting a bright fluorescent protein and a photostable fluorescent protein. In the third post of this series, we will discuss how to select a non-aggregating fluorescent protein. In the jellyfish Aequorea victoria, AvGFP forms a homodimer. In corals, the red fluorescent proteins form tetramers. In general, fluorescent proteins have a natural affinity and a tendency to form higher order aggregates. This property can be tolerated in some applications (e.g. 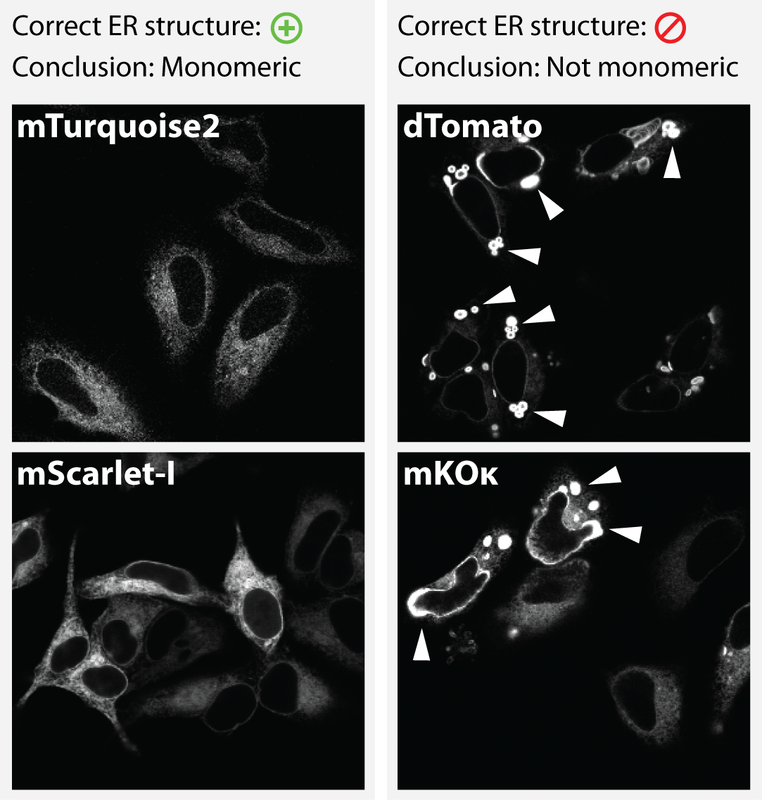 labeling of cells or tracking promotor activity), but it is problematic in applications in which the fluorescent protein is used as an inert protein module. This is explained in more detail here. There are a variety of methods that can be used to measure your fluorescent protein’s propensity to aggregate. The basics and pitfalls of these experiments are discussed here. The previous post in this series described a practical approach to selecting a bright fluorescent protein. In the second post of this series, we will discuss how to select a photostable fluorescent protein. Photobleaching is the irreversible destruction of a fluorophore under the influence of light. Any fluorescent molecule will photobleach at some point. 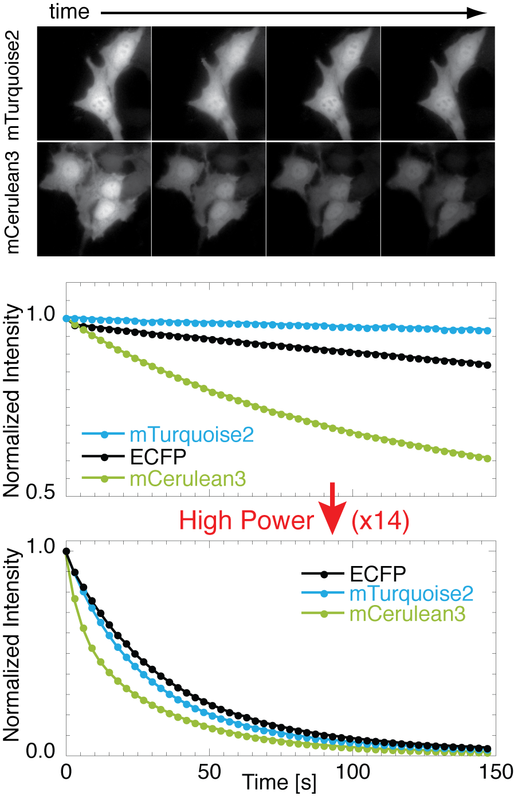 For live-cell imaging, it is desirable to have fluorescent proteins that are photostable. 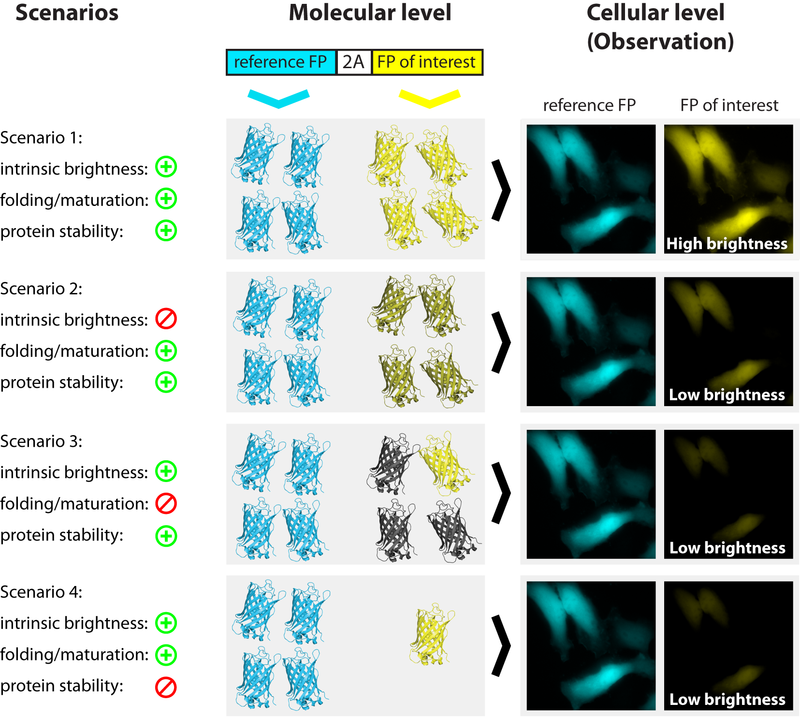 On top of photobleaching, fluorescent proteins may display reversible intensity changes (Shaner et al, 2008; Bindels et al, 2017) and photoswitching (Kremers et al, 2009), which usually are undesired properties. In the ideal situation, a fluorescent proteis should emit a stable fluorescence signal, showing no or little deterioration or change of the signal during the course of the experiment. Before you decide which car you want to buy, it is worthwhile to test-drive a couple of candidates. Before you buy a new microscope, it is smart to look at (and through) a couple of models. Before you start a new project with fluorescent proteins, the best advice is to try a couple of promising variants to check how they perform under your experimental conditions. This is time well spent and, if you do it right, can be (part of) figure 1 of your next paper or thesis. This series of posts explains how to critically assess the reported properties of fluorescent proteins, how to do a head-to-head comparison of fluorescent proteins and how to make a well-informed decision on the best fluorescent protein for your application.